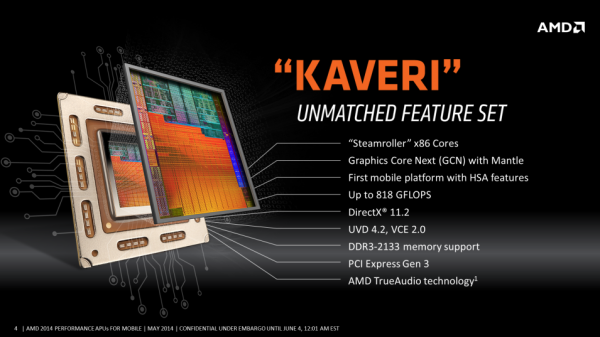 AMD has announced the introduction of new Kaveri based architecture processors for mobile computing. This line includes a suspiciously named FX-series of mobile Kaveri; although it has no relation to the desktop version of the FX processors. Alongside the FX will be A6, A8, and A10 AMD APUs. 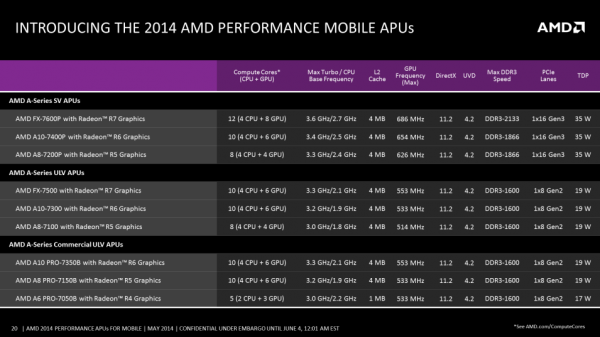 It appears that AMD will be using the FX branding to replace the A12 APU for the mobile version of Kaveri. Aimed at notebooks and laptops, the lineup of processors have a TDP of between 17W and 35W. Comparatively, this is not lower than the previous Trinity or Richland processors. However, AMD appear to have focussed on increasing performance instead of going for power efficiency. Kaveri based mobile APUs will have a slightly increased regular clock speed over the previous generation, but have a much leap forward in terms of their turbo clock speed. Combined with the new R-series graphics, AMD claims that Kaveri is capable of outperforming Intel’s mobile chips at every turn; especially in terms of graphical performance. There is no word on when the processors will be available in devices as of yet.